Leslie A Wilcox, RI, RSMA (1904-1982). oil on canvas, signed lower right. Undated but the event painted is 1975 and was executed in 1977. 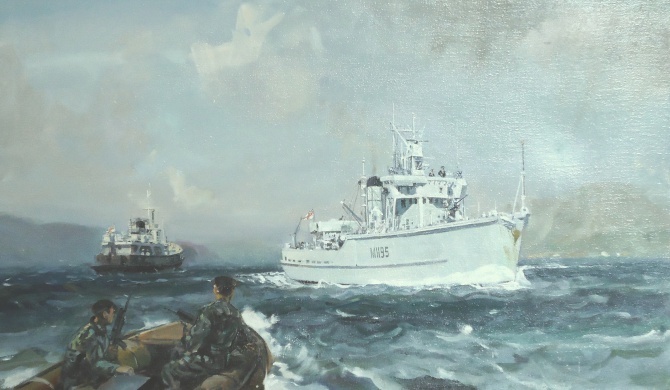 One of many dozens of Ton Class mine countermeasures vessels still serving in the RN in the 1970s, this one, HMS WOTTON, is painted here by Leslie Wilcox whilst on Operation Grenada around the waters off Northern Ireland. On the left is HMS A510, a Loyal Class support vessel of some 80 ft, which together with HMS A382, patrolled the Carlingford Lough under Operation Interknit. One of many dozens of Ton Class mine countermeasures vessels still serving in the RN in the 1970s, this one, HMS WOTTON from the 3rd MCM Squadron and commanded by Lieutenant R A de S Cosby RN, is painted here by Leslie Wilcox whilst on Operation Grenada around the waters off Northern Ireland. On the left is HMS A510 (Lieutenant S D D P Duff RN), a Loyal Class support vessel of some 80 ft, which together with HMS A382, patrolled the Carlingford Lough under Operation Interknit. A510 and A382 were subsequently renamed HMS ALERT and HMS VIGILANT.